Discount Parking is available near US Steel Tower.The parking location listed above offers a special web coupon with guaranteed discounted parking rates. Select the location address to see parking details and print the web coupon. A web coupon must be presented for these special rates, so please present one when you park. 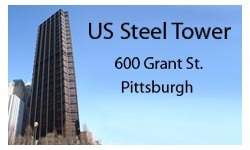 The US Steel Tower is the tallest skyscraper in Downtown Pittsburgh, and is conveniently located near Mellon Green, the Westin Convention Center, Mellon Arena, the DoubleTree Hotel, the Omni William Penn Hotel, and many choices for dining.